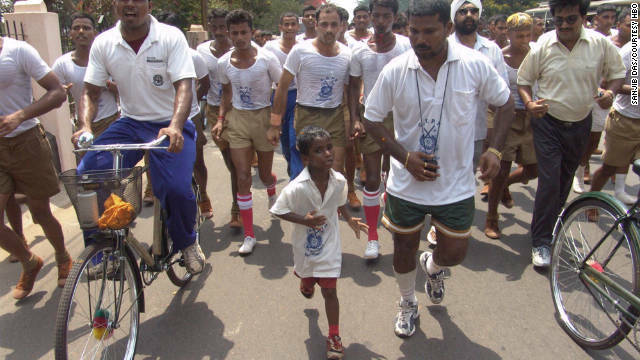 Child marathoner Budhia Singh, of India, runs with then-coach Biranchi Das in the "Marathon Boy" documentary. Budhia Singh's sparkling athletic ability lifted the young marathoner from India’s slums to national stardom. But his age - he ran marathons and longer distances starting at 3 - led to concerns about his well-being. For Gemma Atwal, who filmed Budhia for five years, a crucial question was about how poverty in India could make such a young long-distance runner possible. “Marathon Boy,” which follows Budhia from 2005 to 2010 and explores a line that his mentor walked between benevolence and opportunism, premiered Thursday night on HBO after screenings at numerous film festivals. HBO will show it again Sunday at 1:30 p.m.
Budhia came to Atwal’s attention through a 2005 BBC article, which said the 3-year-old was running as many as 30 miles a day in eastern India’s Orissa state. Budhia’s mother, according to the BBC, had sold him to a man a year earlier for 800 rupees because she couldn’t provide for him. After the sale, local judo coach and orphanage operator Biranchi Das caught him being a bully. As punishment, Das had him run until he returned. When Das remembered to check on the boy five hours later, he still was running, according to the BBC. So Das rescued Budhia from his first buyer, paying the man and putting the boy in his orphanage. The boy who had been destined for a life of begging and extreme poverty was now getting nutritious food and medical care. And at Das’ instruction, he now was running hours and hours a day. Budhia would become a huge celebrity in India through Das, who would set up races for him. The child would run 48 marathons by age 4. At such a tender age, expectations of him capturing athletic glory for India on the world stage were building. Atwal, an India native raised in the United Kingdom, began filming Budhia and Das in 2005, drawn to India in part by Budhia’s “astounding and deeply unsettling” training distances. But besides ethical questions, Atwal said the film focuses on the pair’s “guru-disciple” relationship. Why was the boy running for Das, and what would happen if he stopped? Atwal said she doesn’t question Das’ benevolence. The children he rescued, she said, were the love of his life. But his love of children “was eclipsed by his dream of finding a sport champion among them,” she said. “The problem came when he discovered the boy’s talent for running and set up a highly questionable quest to train Budhia into India’s greatest runner,” Atwal said. Government officials intervened in 2006, temporarily banning Budhia from marathon running after he collapsed following a well-publicized 40-mile run. Das lost custody of the child in 2007 before being slain in 2008, according to the BBC. Budhia, now 9, is at a state-run sports academy, where he mixes with kids of Indian society’s highest echelons and will get free education until age 17, Atwal said. He could ultimately be trained in another sport, such as cricket, but running still is a possibility, she said. She said she hopes, with the help of a Marathon Boy Trust that she and other producers established, to get medical testing for Budhia “before the government decides to start seriously training him.” She said she is concerned about the effects the training has had on his body. “I do have enormous concerns about him now,” said Atwal, who said money raised by the trust also will benefit children at Das’ orphanage and possibly help pay for Budhia’s education after 17. Atwal said her film produces no clear hero or villain. “It’s left to the viewer to navigate their own way,” she said. - HBO is owned by Time Warner, also the parent company of CNN. i couldn't read passed "Budhia’s mother, according to the BBC, had sold him to a man a year earlier for 800 rupees because she couldn’t provide for him." SOLD him, yet clearly there was an orphanage. Suddenly those crazy pageant moms don't look so bad. Well ok it's still disgusting but making a child run marathons is worse. If you had no food to eat, no food to feed your kid, no hope for his future because you live in a rat infested hut what whould you do if someone came along to give your child a better future? This is what people in Europe did all the time a couple of centuries ago. Many sent their kids to America as endentured servants to rich plantation owners. Its all well and easy to condemn this mother and it is truly revolting. But what would you do in her situation? Allow your child to become a poor man, a beggar, a thief or give him even the smallest chance to become a rich man? This is what happens all the time. You do well with kids and they hate you for doing good. Kids that I have trained in Wrestling and Judo have gone forward to give back to younger kids are now being called extremist for doing as I did (sleeping and eating wrestling). Telling kids to read and go to college. So my son has and others have. Now they are being looked at by other coaches for doing and being like me. It is a shame they killed such a good man and the relationship he had with such an unfortunate child as Budhia. Nothing but jealousy and hatred that they could not benefit from such a child. As Budhia's mother says what about the other beggar children in the area who are starving why aren't they so concerned about them. Shame on them. Shame on them all.